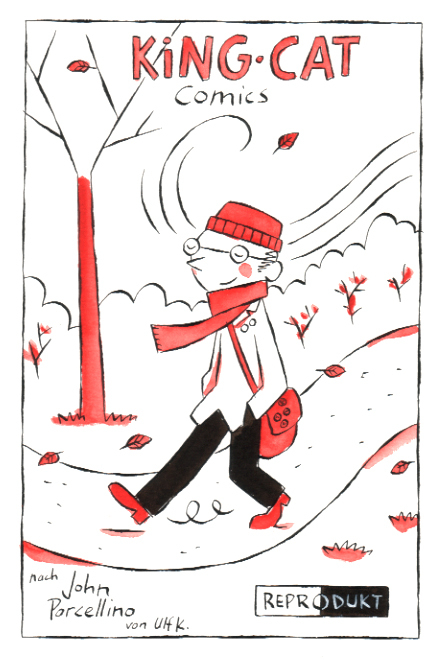 The great German comics publisher Reprodukt is celebrating its 20th anniversary with an exhibition in Berlin. They were the first group to agree to publish my work in book form (although B.ü.L.b. in Geneva managed to get their collection out a tad bit earlier...). And Jutta from Reprodukt just sent me this cool "homage" drawing by the great Ulf K. Wow! 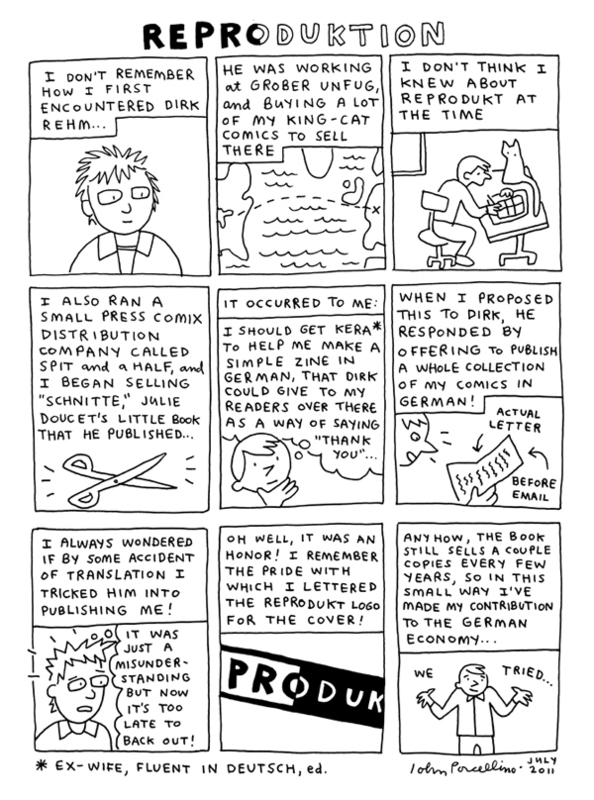 For more cartoonist contributions, please visit the Reprodukt blog. • At first glance, the page seems to be divided into a standard six-panel grid (with the bottom tier broken into 3 smaller panels), but actually each tier is of independent size. The top row panels are slightly taller than they are wide, and taller than any of the other panels on the page. Row 2 is more square-shaped than Row 1 (ie shorter), and Row 3 is even shorter still. The Row 3 panels are divided into a vertically symmetrical pattern, with the two outside panels being slightly wider than the middle one. • Silver Surfer uses the word "word" four times in seven panels. • How many pages like this did Kirby crank out in a day? Because I was exhausted after drawing just this one. • In panel two, the ellipses after "sculptures" contains only two dots; in panel six they save room by adding the exclamation mark onto the final dot in the ellipses. Come to think of it, I'm pretty sure I've used this trick in my own comics before! Also, every line of dialogue on the page ends in an exclamation mark or a question mark. Commas are used sparingly-- most of the text comes in short, staccato bursts. • The Silver Surfer goes from Unquestioningly Destroying the Earth to Understanding Beauty in three short panels. Maybe this is one reason why each one of these classic old comics issues provides the reader with such a fulfilling experience. They are jam-packed. Silver Surfer and Alicia Masters © Marvel Comics Group, Inc.
A tough question. I didn't even try to list what I thought were the Best, because I think that's impossible, so my list ended up being a weird combination of all three. Like many people polled, I stress that this list came basically off the top of my head, and would likely have been different at any other time. Also: ten is too restrictive of a number. Anyhow, I tried not to think about it too hard. You can see my list here. Some people added comments, and since I didn't at the time, I thought I would do so now. My list is in no particular order. I can't really attest to what I think are the "Ten Best Comics" because there are so many highly touted comics I've never sat down with. 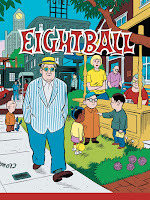 But I can say that Eightball #22 is the best comic book I've ever read. 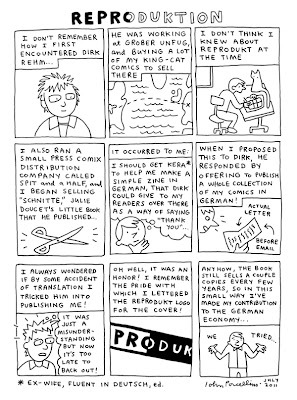 This is the most fascinating of the classic newspaper comics to me, because of the attention to detail, the little quirks and ephemera of life, that King has recorded in his strip. (I can sit and stare for hours at a page, just digesting-- "...so that's what telephone stands looked like in the 20's...") ... And for the fact that it presages so much of what we find in contemporary art comics-- quiet, somewhat deadpan observation; subtlety of characterization; the emphasis on the rhythms of day-to-day life. Plus lots of excitement and adventure. Charming, warm, and funny. 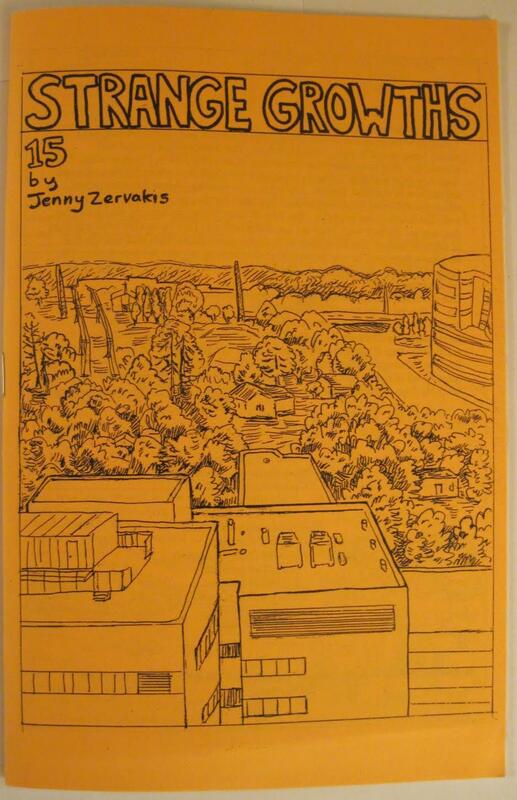 Jenny's scratchy, poetic observational stories about family life, nature, and people on the bus, are some of the most groundbreaking comics ever published that most readers have never seen. 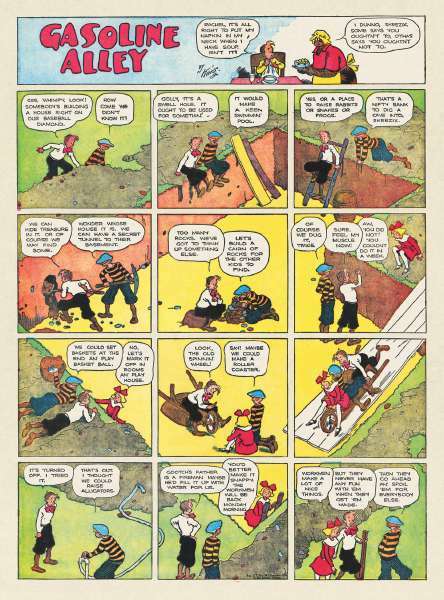 Another comic that probably could be construed as "Best" in many ways, the thing that turns me on about Krazy Kat is the artist's unflinching, career-long approach to creating beauty, suspense, humor, absurdity, and tenderness out of the most basic of narrative materials-- a stage, a love triangle. Pure delight. Whether you like it or not, Jack Kirby is one of the most important artists of the 20th Century. 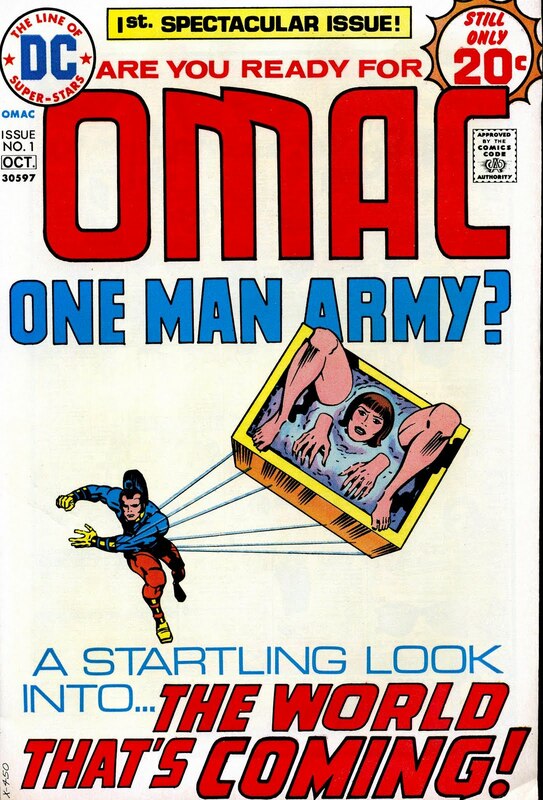 OMAC is "Kirby Unleashed," a frenetic, absurd, confusing world of monumental ideas-- good, evil, justice, corruption, redemption. Like many of Kirby's later works, OMAC was unceremoniously and abruptly cancelled mid-story, but in the case of OMAC, even the final, pasted-in panel works to drive home the sheer bewilderment at hand. Personally, the one strip that, as a teenager, forced me to reassess comics as an artform. The rollicking freedom of her early work is unmatched, and when she began mining deeper, more literary ground, she did so in a way that felt utterly natural and real. First published at the nadir of the comic-book industry (the late 1950's) in titles like Tales to Astonish and Journey Into Mystery, these demented, beautiful, throw-away stories are my favorite comics of all time. 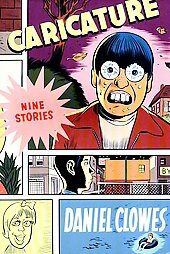 Purely outlandish, intriguingly repetitive escapism, the Monster Comics featured tales of giant robots, walking trees, huge anthropomorphic hills, intergalactic babies, you name it. The maniacal delight of taking any preposterous idea and turning it into a 13 page story is evident, and infectious. 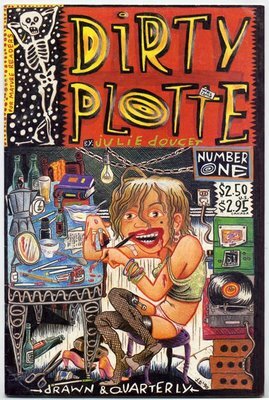 Julie's work was a bombshell dropping on the comics scene. Highly, crazily, personal, they combined the uncompromised confessionalism of the undergrounds with a luscious, cartoony loopiness that comic books had rarely seen before. 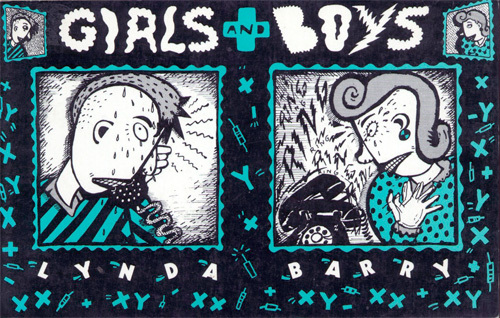 In other words, she created a new direction for "alt-comics," one that is still being explored to this day. 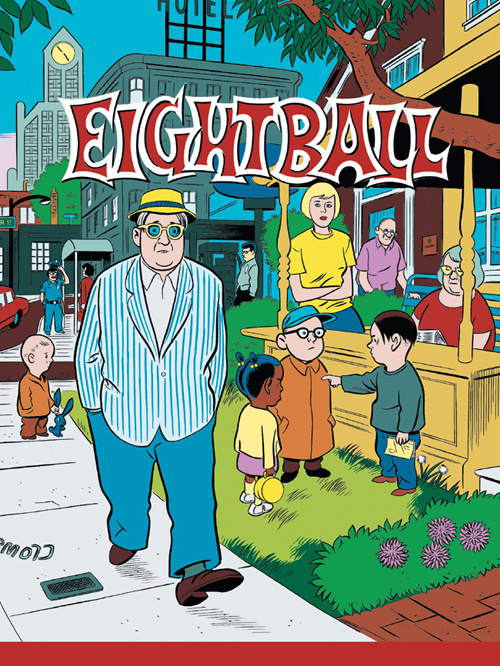 When the stories collected in this book were first coming out, issue after issue, in Clowes' Eightball, you could feel the boundaries of what comics could do expanding with each new arrival. 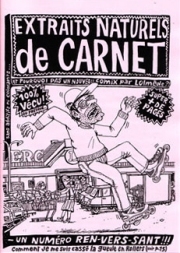 Even though I barely speak French, these are comics that I return to again and again. Lolmède is that pure, ugly, inky, grotesque type of cartoonist that makes depicting the world in blotty, gorgeous lines look easy. Looking at his work makes me want to draw comics. COMICS THAT I CAN'T BELIEVE I DIDN'T INCLUDE ON THIS LIST: Life in Hell, Matt Groening; Dave Kiersh's Teen Angst stories; Love and Rockets, Los Bros Hernandez; ACME Novelty Library, Chris Ware; Hercules Among the North Americans, Mark Marek; Jeff Zenick's zines; Cecil and Jordan in New York, Gabrielle Bell; "Wild Kingdom," Kevin Huizenga; ask me again next week. Yes, this old man can't help it. The Traveling Used Paper Salesman is going back out on the road again. Here are the dates. Come on out if you can! And thanks, everyone... Look for more dates in the fall, too! Yes, I'll be at this super-gigantic-comic-convention for one day only. BUT I have serious doubts as to whether my ears will be able to handle the noise, so don't go there just to see me... I might have to bail after 15 minutes, you never know. Anders Nilsen's BIG QUESTIONS Chicago Release Party! I'll be on hand performing lite rock favorites for your listening and dancing pleasure. Plus maybe Zak Sally and other special guests. I have work in this exhibit, . The show itself runs through October 16, with a closing reception 10/14. PLEASE NOTE: I've decided to skip the opening, but WILL be present at the closing reception. See you there! I'll be tabling at the Chicago Zine Fest booth, along with other local zine publishers, on Saturday 9/10 from 12-6 PM, so come on down! The fest runs through Sunday, but I'll only be there Saturday. Slideshow and signing with the great Tim Lane! With Phoebe Gloeckner, Jessica Abel, The Hernandez Brothers, James Sturm, and Joe Sacco, plus a host of comics scholars and educators!